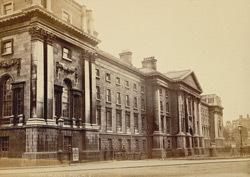 "Trinity College was founded by Queen Elizabeth in 1591, and erected on the site of the ancient monastery of All-Hallows. The buildings, which form one of the principal ornaments of the city, consist of three spacioous quadrangles. The entrance front, presented to College-green, is 308 feet in length, and of the Corinthian order of architecture; the centre is ornamented by a pediment, resting on columns, and the whole is terminated by pavilions, decorated with coupled pilasters, supporting an attic story. The first, or principal square, is entered by an octagon vestibule, terminating at the summit in groined arches. It is 560 feet in length, by 270 in breadth. Besides buildings for the accommodation of the Fellows and students, this square contains the chapel, theatre for examinations, refectory, and library...The College walls embrace thirty-three acres, of which eleven are occupied by buildings, four by the Fellows' garden, and eighteen are under the park." Descriptive letterpress from the book 'Photographs of Dublin'.